Categories: Ethnic Products, Wash Day. African Naturalistas Turmeric black soap is our magic formula to smooth acne-free skin. It cleanses the pores thoroughly, while being extremely gentle. It clears scars, skin irritation, stubborn spots, acne scars, etc., and gives an even tone to your natural skin colour. It thoroughly exfoliates facial and body skin, getting rid of stubborn dirt. 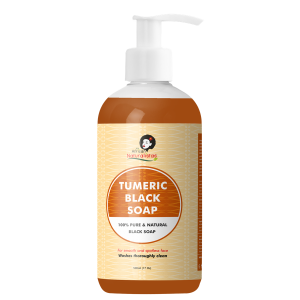 For body wash, pour a little liquid black soap on section of body, wash with sponge, and rinse thoroughly.